Phylogeny.fr has been designed to provide a high performance platform that transparently chains programs relevant to phylogenetic analysis in a comprehensive, and flexible pipeline. Although phylogenetic aficionados will be able to find most of their favorite tools and run sophisticated analysis, the primary philosophy of Phylogeny.fr is to assist biologists with no experience in phylogeny in analyzing their data in a robust way. The "One Click mode" targets users that do not wish to deal with program and parameter selection. 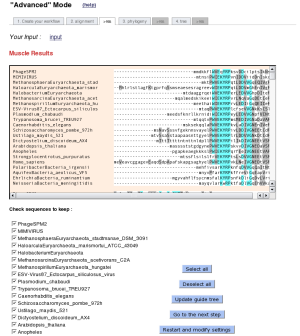 By default, the pipeline is already set up to run and connect programs recognized for their accuracy and speed (MUSCLE for multiple alignment and PhyML for phylogeny) to reconstruct a robust phylogenetic tree from a set of sequences. 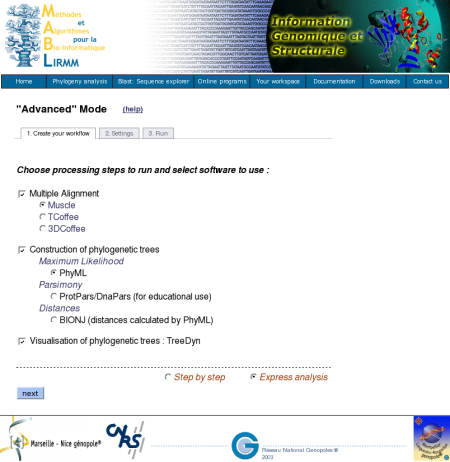 In the "Advanced mode", the Phylogeny.fr server proposes the succession of the same programs but users can choose the steps to perform (multiple sequence alignment, phylogenetic reconstruction, tree drawing) and the options of each program. Alternatively, users have the possibility to run the different programs separately. 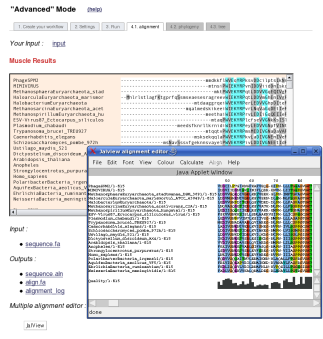 This is a "default" mode which proposes a pipeline already set up to run and connect programs recognized for their accuracy and speed (MUSCLE for multiple alignment, optionally Gblocks for alignment curation, PhyML for phylogeny and finally TreeDyn for tree drawing) to reconstruct a robust phylogenetic tree from a set of sequences. 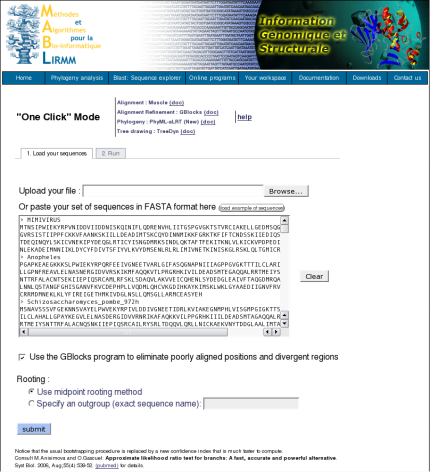 What users have to do is just to copy and paste their set of sequences in the FASTA format (or upload their FASTA file) and to click the Submit button. The system will do all the rest work, all the parameters are those of programs by default. However, users are able to decide to use or not the Gblocks program to eliminate poorly aligned positions and divergent regions, by checking the corresponding checkbox in the form page. 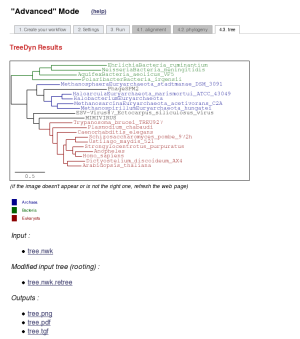 At the end of the analysis, the server displays a publication quality image of the phylogenetic tree. 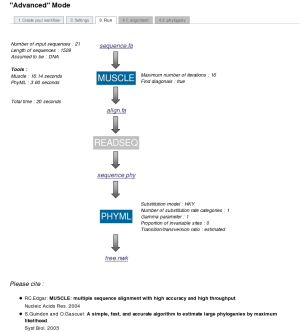 Several studies and especially the BAliBASE benchmark showed that MUSCLE achieved the highest ranking of any method at the time of publication. This step is optional. Gblocks eliminates poorly aligned positions and divergent regions (removes alignment noise). Parameters are set to their default values in Gblocks. These are rather stringent; e.g. all positions with gaps are removed. PhyML was shown to be at least as accurate as other existing phylogeny programs using simulated data, while being one order of magnitude faster. HKY fits well in most cases as it modelizes the main features of DNA substitutions: transition/transversion and unequal base frequencies. LG has been shown to be the best amino-acid replacement matrix to date. Gamma distributed rates are mandatory in most (if not all) analyses, and using invariant sites generally improves (never degrade) the fit. TreeDyn offers many tree customization options compared to other tree rendering tools and especially for tree annotations. The starting output tree is rooted using mid-point rooting method (performed by Retree from PHYLIP package) but the user can reroot the tree using our dynamic tree editing interface. The pipeline is the same as the "One Click" mode but is flexible enough to allow users to select which steps to perform. In this manner, the input data can be a set of non-aligned sequences in FASTA format, an alignment of multiple sequences in FASTA, PHYLIP or Clustal format, or a tree in NEWICK format. Users are provided with options to set the parameters of the different programs of the pipeline. Furthermore, the system offers the possibility to control results of each step before launching the next program, so that users can modify and properly adjust parameters for a given task. This is possible in checking the "Step by step" option. In the case of an "All at once", at the end of the pipeline processing, users have access to detailed reports for all the different analysis steps of the pipeline through different tabs of results. At the end of the analysis, users have the possibility to look at a schematic representation of the workflow, with details about software options, so as the references of the different selected tools. This summary of the run is accessible through the "Overview" tab since the analysis is finished. This fonctionality is also observable in the "One Click mode". In the case of an "Step by step" analysis, users have the possibility to control and edit the results of each step before launching the next program. 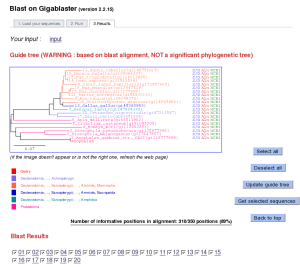 A fast BLAST search on Gigablaster allows to quickly explore your sequence neighbors. Paste your single sequence, run blast and explore its homologous sequences. The system facilitates the selection of homologous sequences, based on a 'quick-and-dirty' phylogenetic representation using BLAST results and an estimator of the final multiple alignment length. 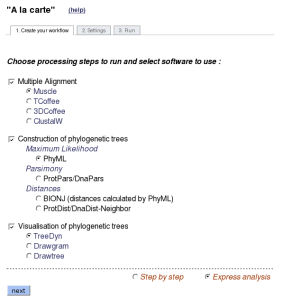 Table II: Main tools available on Phylogeny.fr. 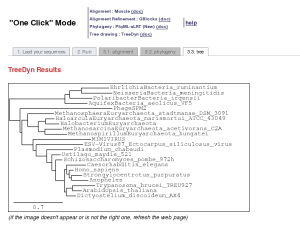 Note: With fast programs Phylogeny.fr displays the results within a few minutes or less. Slow programs require about one hour or so, but their results are still displayed on-line, while the results of very slow program are sent by email. Blastall 2.2.17 Sequence searching Raw, FASTA FASTA Fast None Advanced and "A la Carte"
<50 protein sequences, <2000 sites "A la Carte"
<200 protein sequences, <2000 sites "A la Carte"
TNT 1.1 Phylogeny using parsimony FASTA, Clustal, PHYLIP, EMBL, PAUP*/Nexus Newick Fast to Slow <200 sequences, <6000 sites "A la Carte"
<500 taxa for Neighbor "A la Carte"
<1000 replicates with TNT Advanced and "A la Carte"
<1000 replicates with Protdist "A la Carte"
Drawgram 3.67 Various tree shapes rendering Newick, New Hampshire Extanded, PAUP*/Nexus PNG, PS, PDF Fast None "A la Carte"
Drawtree 3.67 Unrooted tree rendering Newick, New Hampshire Extanded, PAUP*/Nexus PNG, PS, PDF Fast None "A la Carte"
This format can be used for single sequence, multiple sequences or alignment. Each sequence begins with a single header line providing the sequence name (optionnaly description), followed by lines of sequence data. The description line must start with a greater-than (">") symbol in the first column. This format can be used for single sequence or multiple sequences. Each sequence entry begins with a line containing the word "LOCUS", indicating the short name for this sequence, followed by several annotation lines. The start of each sequence is marked by a line containing the word "ORIGIN" and the end of each sequence is marked by two slashes ("//"). Each sequence starts with an identifier line containing the word "ID ", followed by several annotation lines. The start of each sequence is marked by a line starting with the identification "SQ", and the end of each sequence is marked by two slashes ("//"). ID   Homo sapiens; AA; UNK; 354 AA. ID   Arabidopsis thaliana; AA; UNK; 333 AA. This is an alignment format. The first line contains the number of sequences and their length (in characters) separated by blanks. The next line contains the sequence name, followed by the sequence in blocks of 10 characters. The word "CLUSTAL" is on the first line of the file. The alignment is written in blocks of a fixed length. Every block starts with the sequence names (maximum of 10 characters), followed by at least one space character. The sequence is then displayed in upper or lower cases, "-" denotes gaps. A count of the total number of residues may be shown at the end of the line. Below each block of residues, an additional line shows the degree of conservation for each site. Nexus format can be used for multiple sequences, alignments, distance matrices and trees. It starts with "#NEXUS". It has been detailed in Maddison & al., NEXUS: An Extensible File Format for Systematic Information.